Sometimes you find cool cookie cutters in the strangest places. My son is currently obsessed with Herbie the Love Bug and everything Volkswagen related. One night I pulled up the VW website to show him pictures of cars and started browsing the online store. 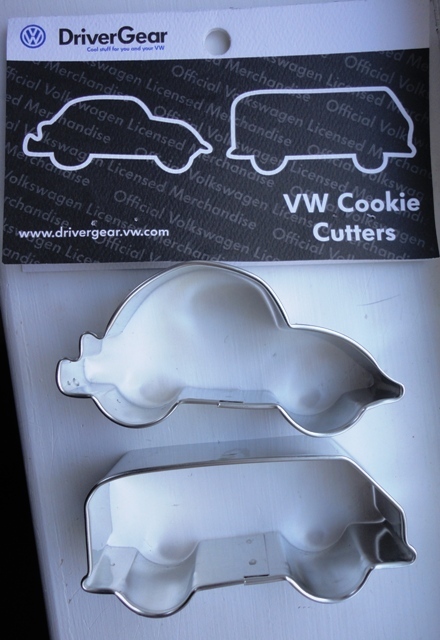 As soon as I saw the VW van cookie cutters I knew I had to order them. My son had already asked if could have a Herbie the Love Bug birthday cake. (Note the his birthday isn’t until November.) 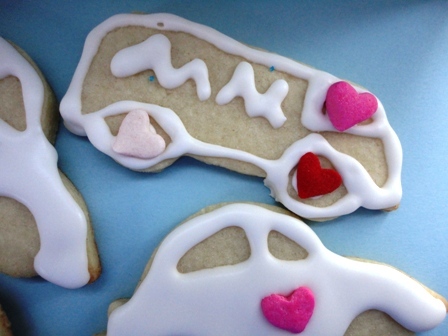 I knew he would love VW-shaped cookies. Two days ago the cookie cutters arrived and of course the kids wanted to make sugar cookies immediately. I couldn’t make my new favorite sugar cookie recipe because the dough needed to chill in the fridge for three days before baking. Plus I didn’t have it in me to bake that many cookies. Out came my trusty Martha Stewart’s Cookies cookbook and we found a sugar cookie recipe that only required one hour of chill time. 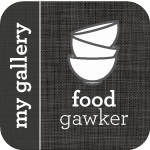 My kids and I thought this recipe was very good. They made cookies for their grandparents and some friends. 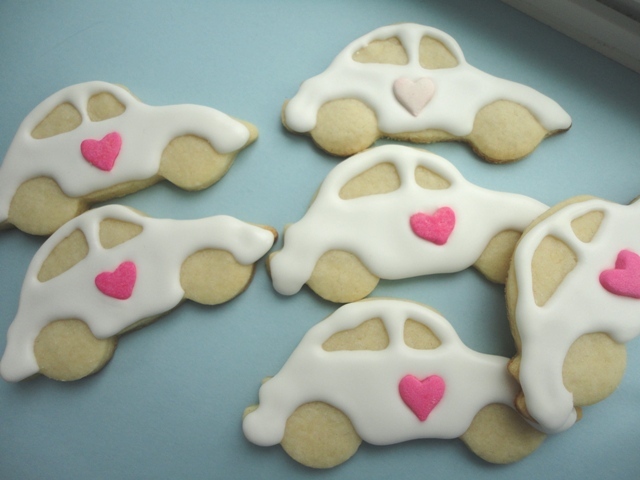 I’m making a note for next Valentine’s Day since the Love Bug cookies turned out so well and were really fun to make. Combine dry ingredients in a bowl and set aside. In another bowl, cream together butter and sugar using an electric mixer. Mix on medium speed until pale and fluffy. Mix in the eggs and vanilla. Gradually mix in the flour mixture. Divide dough in half; flatten each half into a disk. Wrap each in plastic. Refrigerate until firm, at least 1 hour or overnight. Preheat oven to 350 degrees F. Cut off a palm-sized piece of dough with a dull knife and roll out on a lightly floured surface to just under 1/4 inch thick, adding more flour as needed to keep dough from sticking. Cut out cookies with a cookie cutter, transferring shapes to parchment-lined baking sheet as you work. Continue rolling out dough until you fill your baking sheet. Place extra dough back in the fridge while you bake one sheet of cookies for 5-6 minutes. The edges of the cookies should just start to be turning golden. Remove from oven and leave on baking sheet for 1 minute before transferring to cooling racks to cool completely. Repeat with remaining dough including any scraps from when you are cutting the cookies. 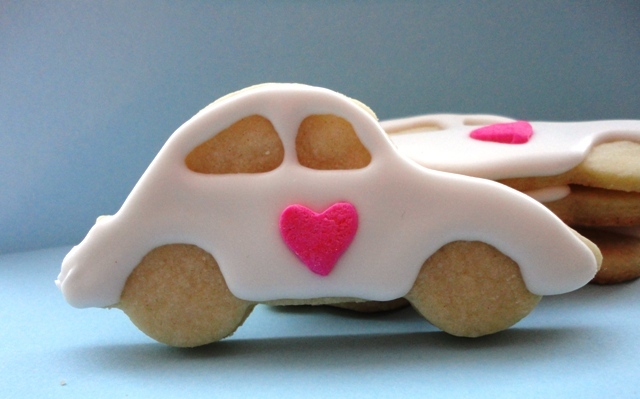 Decorate cooled cookies with royal icing. Allow the iced cookies to dry overnight before placing in an airtight container for storage up to one week. My daughter decided that the vans needed to be the Mystery Machine from Scooby Doo. I was inspired to make Love Bug cookies by a post on Duck Valentines Cookies by Anotheryarn Crafts. I just couldn’t wait until next year to make them. Both kids rate this recipe 5 stars and I would have to agree. Their dad hasn’t tried them and probably won’t because he’s not really a cookie guy. 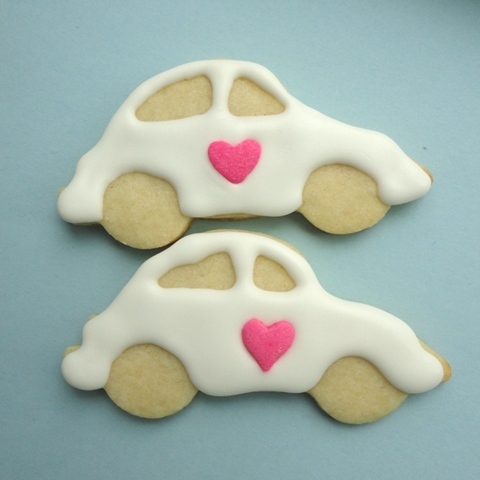 My husband (still a kid at heart) would love VW Beetle cookies. They are so cute. The Mystery Machine! I know another Scooby Doo fan who would love that. I wonder if these cookies count for slugbugs? 🙂 These cookies are WAY too cute and the royal icing adds depth that makes them look really cool. Darn it now I want sugar cookies! Dionne – this comment started my day with a smile this morning. We are constantly on the look-out for VW’s on the road. These look awesome! You did a perfect job decorating them. And of course you needed a Mystery Machine! LOL My daughter would feel exactly the same way. How adorable! I love that you decorate them with hearts for love bugs. They look delicious, too! These are really the cutest cookies and yous always look so perfect. What a fun mom you must be! ohhhhh they are sooo adorable!! cute-as!! i bet they are tasty too!